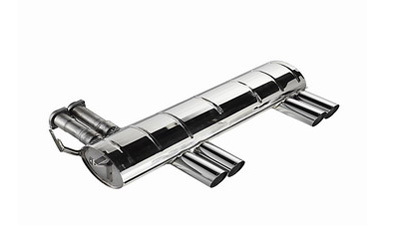 Eisenmann Exhausts are as synonymous with quality as they are sonorous in sound. There quality is exceptional making them the choice manufacture of exhausts for Brabus, AMG, G-Power, Rieger, Porche, Digi-Tec, and other legendary German marques. If you want the ultimate exhaust for the ultimate driving machine you can't go wrong with an Eisenmann system. This full Stainless steel E46 M3 application has (Your choice of) quad polished tips, engraved with the Eisenmann logo arranged to fit in the OEM manner for classy yet aggressive looks. Tip sizes/styles available (above) to fit any taste or style preference. Available in either Sport (quieter) or Race (louder) Sound. The Sport passes Germany's strict TÜV standards if you are looking for a more refined sound level, and this is also the VAC recommendation for street cars. Most Eisenmann exhausts are built to order. Though many of todays popular applications, like M3s, are kept in stock, please allow up to 3 to 6 weeks from Germany to your door when ordering. If you need an exhaust you don't see or for another application or brand of car, let us know. We can supply any Eisenmann product fast!